Oooh, I really like your mei tai. Gorgeous colors! I only have a few carriers, but I hang a couple of them on a hook in the back of our entryway closet, and a couple others are usually folded and put on a shelf in that same closet (though they’re out on loan now). I was thinking I should get Ivy in on my photos, too, but it’s a miracle I got up what I did! I keep all of mine in our hall closet. And some in the car. And some in a corner of every room… gah. I love the colors of the mei tai! As for me, I have a large basket by the front door for my baby carriers. It works well because it makes getting out of the house that much easier. I can get the baby in a carrier while my 4-year-old does the shoes / coat / different shoes / different coat / I need a toy dance. That mai tei si really pretty. I think that is the same Moby that I have. Where do you store them is a great question!!! Mine – well since I only have three they are easier to store. 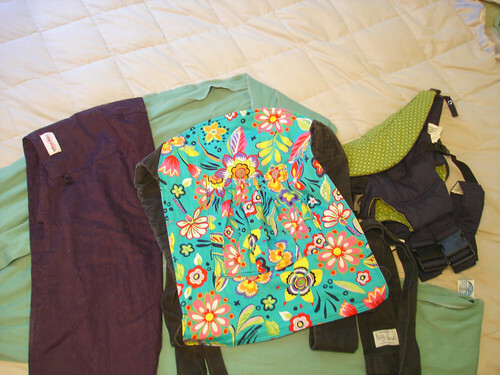 My Moby I keep in the diaper bag, the pouch sling I keep in the car (sometimes in the diaper bag) and the snugli is on the floor of my closet but I never use it anymore. 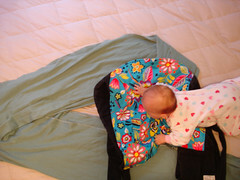 a) I’m sure I’ve asked this before, but I’ve since forgotten: what type of cloth diapers do you use? b) I love the color of the Kozy =) I wish I could have picked colors like that or like the Mei Tai for our carriers, but my husband objected on the grounds that if they fit him and I expected him to wear them periodically, they had to be masculine. To which I was all: WHATEVER, this is a man who craves chocolate. I keep all 3 of my carriers in the van. They’re folded in a small basket. I hate to be out and not have one, so keeping them in the van is the best place for me and it’s a short walk into the garage to get one out when needed. Wow you almost have as many as I do I have 5 I keep 2 in Laila’s closet they where in the changing table but now I have to many diapers (I think I have a problem), one in the car just in case I forget to bring the best one of all my Ergo! It doesn’t have a place to live because it is always on I can wear Laila for hours in it and she loves it too. What a great idea to show all your babywearing gems! I’ll post my carriers sometime this week. 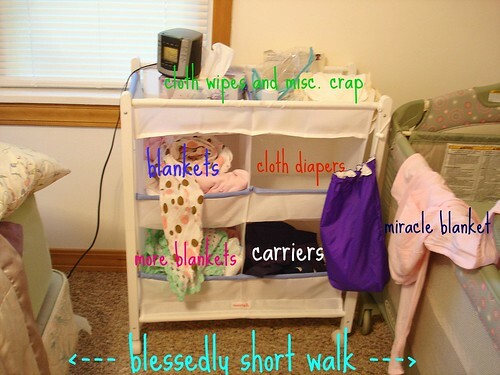 I store my carriers on a hook in Little One’s room. Easy access. You have a cool babywearing stash! I haven’t tried the Moby yet, but I want to! I love your stash. The picture of your room is too cute. 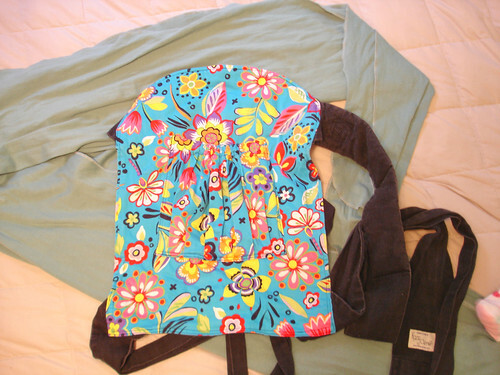 I am hosting a HAVA sling giveaway, if you are interested: http://tinyurl.com/nkkzbe Blessings!